Grist.org says the good reverend may now be facing jail time. “A little over a month ago, the Reverend Billy was arrested on a New York subway platform. This was a little unusual, but not very. The Reverend, a performance artist and activist named Bill Talen, had just been singing, dancing, and preaching into a megaphone inside of a Chase branch in midtown Manhattan, about how the bank’s investment practices were contributing to climate change,” the article says. The City of New York is charging Talen and choir director Nehemiah Luckett with riot in the second degree, menacing in the third degree, unlawful assembly, and two counts of disorderly conduct for the Chase protest. The pair faces up to a year in prison. Read more about this, with a Rev. Billy interview, at Grist.org. After beginning as a solo performer, Reverend Billy soon acquired a loose organization that assisted in his in-store actions. These were originally centered around the Disney Store. In one early action, Talen and his associates pretended to be shopping at the store and talking on non-functional cell phones, carrying on increasingly loud conversations about the evils of Disney and its products; once the ruse was discovered, Reverend Billy began preaching to the actual consumers until the police removed him from the store. 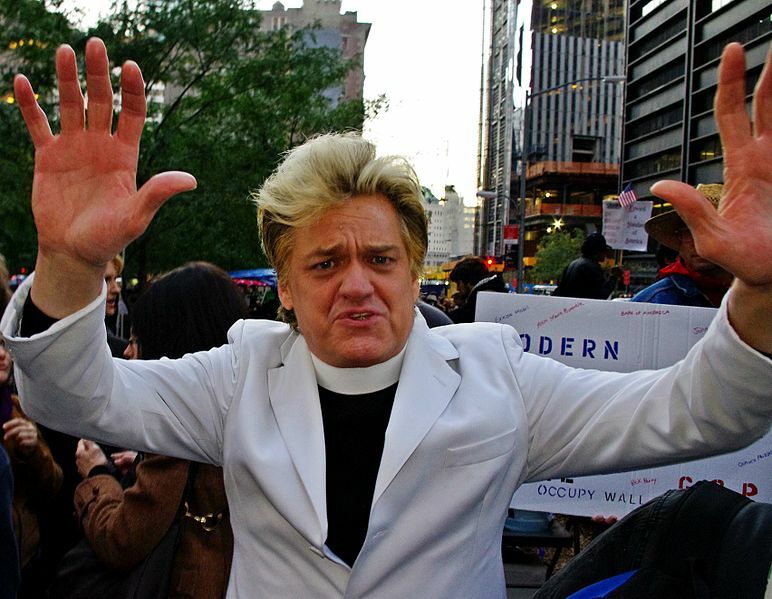 Reverend Billy at Occupy Wall Street, where he has shown up several times to support the protesters. Photo by David Shankbone, Wikipedia. The Starbucks coffeehouse chain became another frequent target of the Church’s actions, due to perceptions of its displacement of local small businesses, unfair labor practices including union busting, and its role in creating what Talen calls a “fake Bohemia“. Reverend Billy and his choir traveled to Washington, D.C. in March 2007 to participate in an action against the war in Iraq, “Don’t Buy Bush’s War,” organized by Code Pink Women for Peace, where they roamed the halls of the U.S. Congress preaching and singing their anti-war message. No arrests were made. The cross-country journey that Reverend Billy and his choir made in the month prior to Christmas 2005, culminating in his arrest at Disneyland, is depicted in a documentary, titled What Would Jesus Buy? produced by Academy Award-nominated filmmaker Morgan Spurlock. The film was screened at the Silverdocs international film festival in June 2007.